Some of you may know this one, but some may not. You can middle click (press the mouse wheel) on any link to open it in a new tab. To close a tab, just middle click on the tab. This is often much faster than going to the red “X”. By default Firefox only shows the tab bar when multiple tabs are open. This is done to keep the UI simple, and maximize the space available for the page itself. 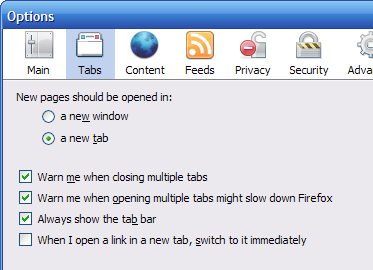 Other browsers such as IE 7 keep the Tab UI visible at all times. If you prefer this, you can change it by going into Tools -> Options and clicking on the “Tabs�? tab. Then check the box next to “Always show the tab bar”. What if you have Windows Vista and when you press the mouse wheel button it doesn’t have any effect on the tabs, but it instead opens up all of your “windows”. You will know what I mean if you have Vista, if not then it’s kind of hard to explain. enjoyed this FF tips series. thanks!